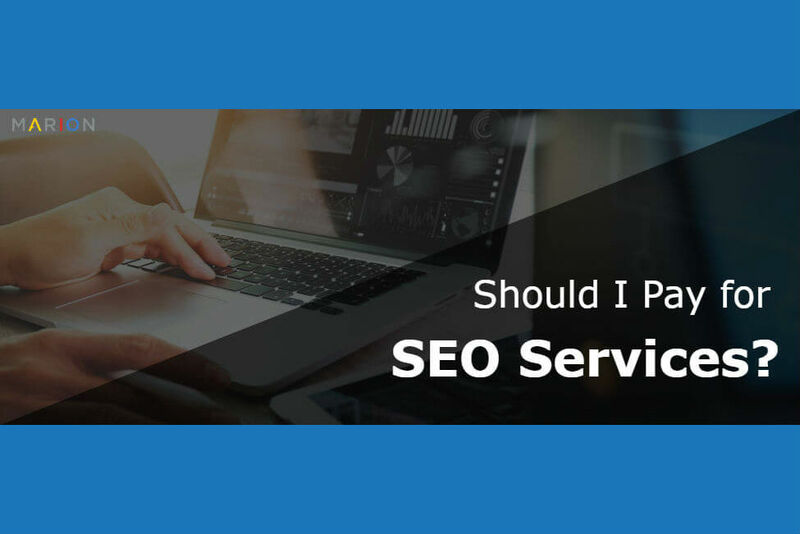 Should I Pay for SEO Services? | How Much Do SEO Services Cost? Are you allocating around 8% of your revenues to marketing? According to the SBA, small businesses should have a marketing budget of around 7-8% of their yearly revenue. The Small Business Administration goes on to mention that in certain industries, businesses may need to earmark up to 20% of their yearly revenue during the early branding years. A 2017 study from BrightEdge shows that an average of 51% of all web traffic comes from organic search. If your marketing budget should be 8% of your yearly revenue, and half of your small business marketing results come from search engines, then shouldn’t you be investing 4% of your yearly revenue in SEO? For a small business with approximately $5 million in yearly revenue, you could reasonably be investing up to $16k per month to reach SBA budgeting benchmarks. This begs several questions for small business owners. Should I pay for SEO services or do it myself? There’s a good chance you started your business because you are an expert in your industry and not SEO. Read through the following considerations to better understand how much to spend on SEO, and whether or not you can do it yourself. What Kind of SEO Help Do You Need? Depending on your industry, you may be generating several million in revenue without maintaining a staff of your own. You could be a solopreneur, or leverage contractors when you need to execute outside of your area of expertise. Depending on your preferences and business goals, you have the following options when it comes to search engine optimization. The do-it-yourself approach to SEO is not for everyone, especially if you’re strapped for time. According to a March 2017 tweet from Google’s own Gary Illyes, Google’s algorithm goes through an average of 3 updates per day. As a small business owner trying to manage customers, your business process, and even your own books, you likely don’t have the capacity to follow Google’s algorithm updates. If you decide to take on this responsibility yourself to cut the hard cost of SEO services, then you’ll need to learn up on the basics. Luckily there are plenty of free online resources that you can leverage during your SEO training. Doing your own SEO requires a larger investment of your time in return for lower search engine optimization costs incurred by external resources. There’s also a good chance that you’ll recognize early in the game that you need to heavily edit or even redesign your website. While a bias for action generally gives you an edge in business, it can have the opposite effect in the realm of SEO. Make sure you learn how to redesign a website without losing SEO before you make any changes. Your next option is to hire an SEO specialist. If you’re a small business owner wanting to keep your payroll taxes to a minimum, this option may not be for you. Hiring a W-2 employee will also require management on your part, so your time is still at risk of being invested in SEO. You will likely be limited to paying for an employee with a few years of experience since you won’t be able to provide much direction for new marketing talent. One of the advantages of hiring an in-house SEO expert is that you have more control over the process without becoming too involved. Content creation and industry subtleties won’t go overlooked because your employee has direct access to your insights, and will become very familiar with your industry over time. The biggest disadvantage is that hiring your own in-house SEO specialist costs not only more time on your part, but wages and payroll taxes too. How much is search engine optimization when you add up all the hidden costs of an employee? It may be less expensive to hire an agency that comes with experience and specialized resources that a W-2 worker probably won’t have access to. Hiring an SEO company is the best option for a small business owner or operator who values their time and wants to leverage the collective power and expertise of SEO professionals. SEO services pricing will vary based on your business goals, and there is a minimal time investment required on your part. How much do SEO services cost when you use an agency? You can take most of your time out of the cost equation, and consider only the monthly SEO rates between agencies. Keep in mind that not all agencies will perform on the same level. In business, you get what you pay for, and that is especially true for the value of SEO services. For the highest quality SEO services in Texas, contact MARION marketing today. We’ll go over your business needs, and craft a unique strategy that will grow your online presence and bottom line. How much is SEO per month vs. as a project fee? There is a difference, but whether or not you should use ongoing monthly SEO services or project-based search engine optimization pricing will depend on your long-term goals. A monthly retainer makes the most sense for a business without their own SEO talent. Even for small businesses with a marketing manager or CMO, the internal marketing talent may not know enough about SEO to want to make optimizations themselves. If you only need your company’s website “cleaned up” from a technical SEO standpoint, paying monthly SEO rates will not align with your goals. Project-based pricing will make more sense for a small business that has an internal marketing team but needs to establish a healthy search engine optimization foundation. The internal team may have experience with blogging and social media management but needs help formatting their site structure and website page templates to improve their inbound marketing results. It may seem attractive to pay an SEO project fee and hope that you can just coast once your SEO support completes the job. However, without regularly publishing skillfully created and technically polished content, your organic traffic will slowly dwindle. Content marketing services play a major role in the success of your SEO, and project-based pricing will not help you achieve lasting success. Hourly SEO pricing makes the most sense for a do-it-yourself small business owner or a company with a small marketing team that lacks SEO experience. SEO consultants can help pinpoint technical website challenges while training you or your team to maintain your organic performance. If you require a substantial amount of hourly consulting work, you may consider opting for monthly recurring SEO services to avoid reinventing the wheel. Let’s go back over the disclaimers before you decide how much to spend on SEO. What are your goals? The higher your growth goals, the higher your SEO spending should be. You get what you pay for. If you’re wanting to pay low prices, you can expect low-quality results. If you’re paying for SEO only, your prices will be lower than for an all-encompassing digital package or a full-service marketing package. The following ranges of SEO pricing are from a survey of over 400 respondents that was released in early 2016. The following ranges are referring to the cost of monthly SEO services. These costs for SEO services seems to align with the SBA’s marketing budget benchmarks. The next time you ask yourself if you should pay for SEO services, you’ll be able to make an informed decision based on the above data. The amount you will spend on SEO services will hinge on your business goals and the firm that you choose to partner with. Contact MARION today for more information on how our marketing services can help grow your bottom line.